Refoaming a pair of 107s. First I carefully tested and measured the tweeters, due to internet rumors that the Ferrofluid "dries out" and reduces their output. They were flat to about 23.5 kHz, and just fine. The biggest part of this job is just getting the woofers out of the box! The funny part is that not only do they have conventional foam surrounds, but they also have a foam donut-shaped "dust cap" to accomodate the aluminum rod that joins the two magnet structures. 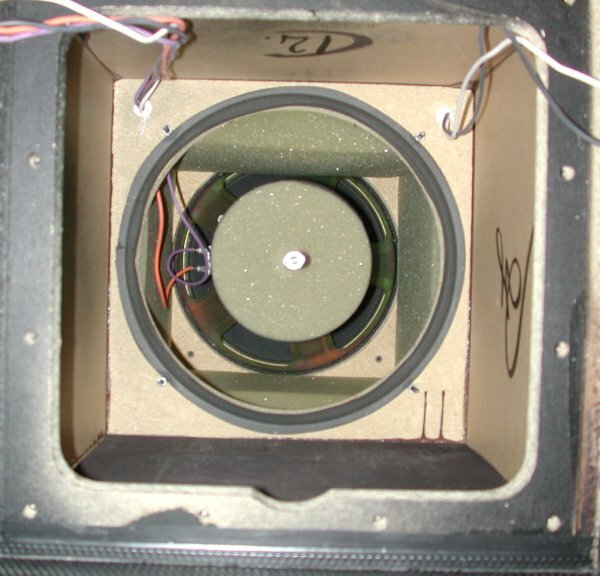 Start by removing and setting aside the midrange/tweeter module. Next remove the decorative top cover - it is attached by four pegs and rubber grommets similar to many speaker grills, and has to be gently pried upwards. Set aside. Remove all the bolts around the perimeter and set aside. Lift out the top cover along with the crossover module. Carefully mark every wire with the terminal number it attaches to and remove all the wires from the crossover. Set the top and crossover aside. Remove the five pieces of foam and set aside. Now we can remove the top woofer. Undo the four locknuts holding the basket down and set aside, along with the washers. Undo the bolt in the center of the magnet and set aside. 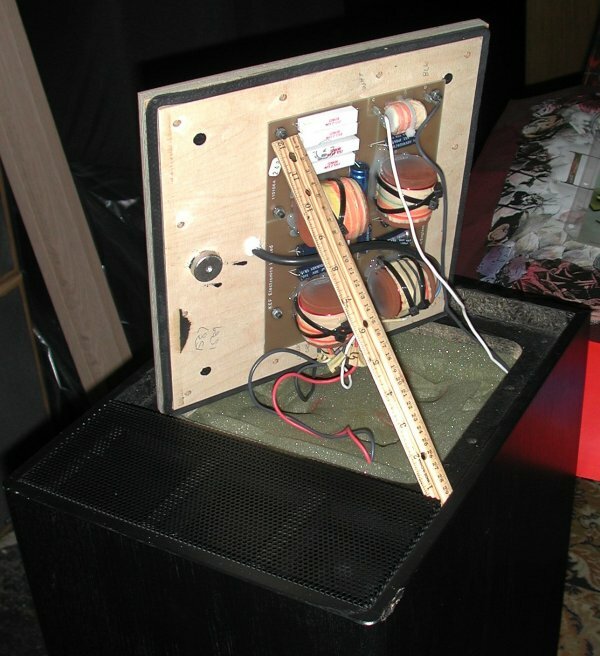 Carefully pry the woofer free of its mounting gasket and lift out of the cabinet. Reach in and disconnect the two wires from the bottom woofer, noting carefully which color goes to which terminal. 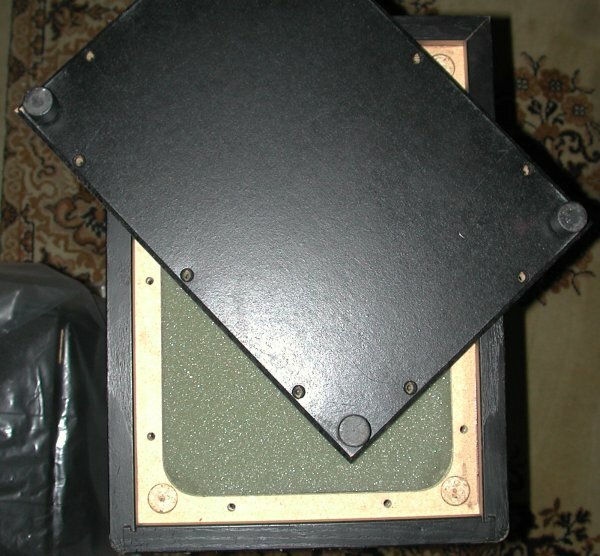 Turn the speaker upside down and remove the bolts around the perimeter of the bottom panel. 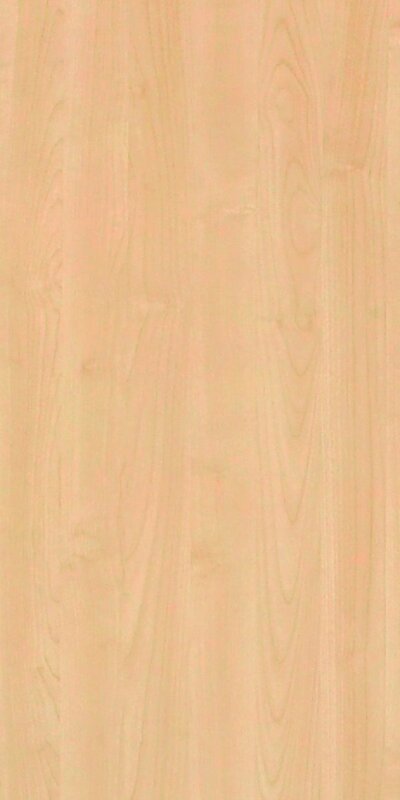 Remove panel and set aside. 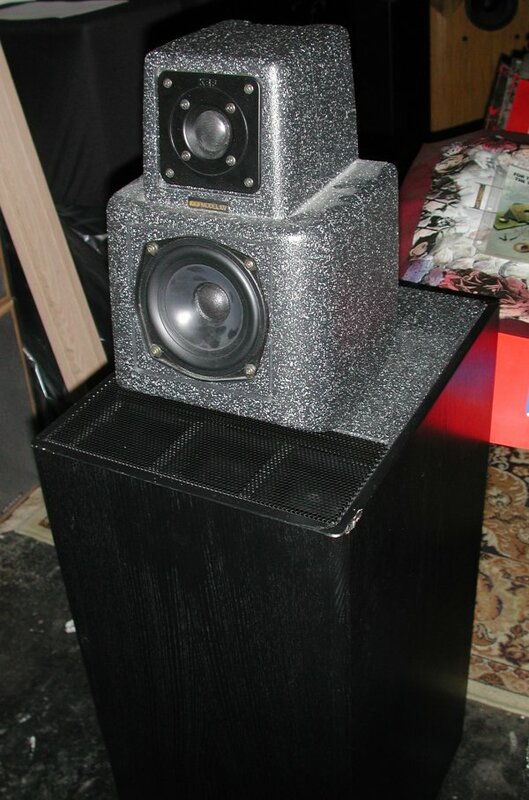 Remove the two large pieces of foam and tear the small piece that goes around three sides of the bottom woofer free. Set aside. 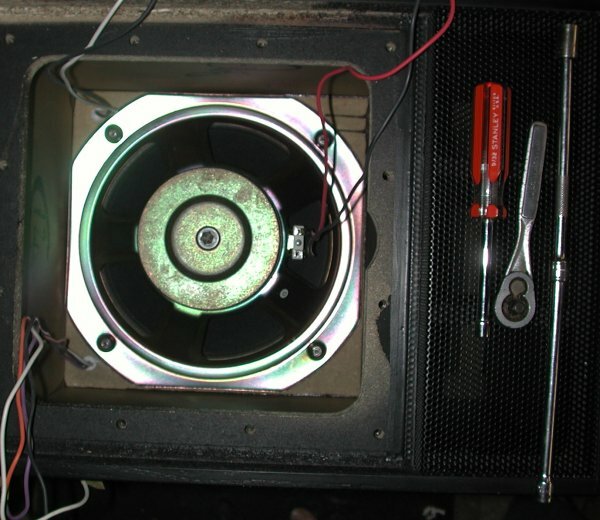 Remove the locknuts and washers holding the bottom woofer and set aside. 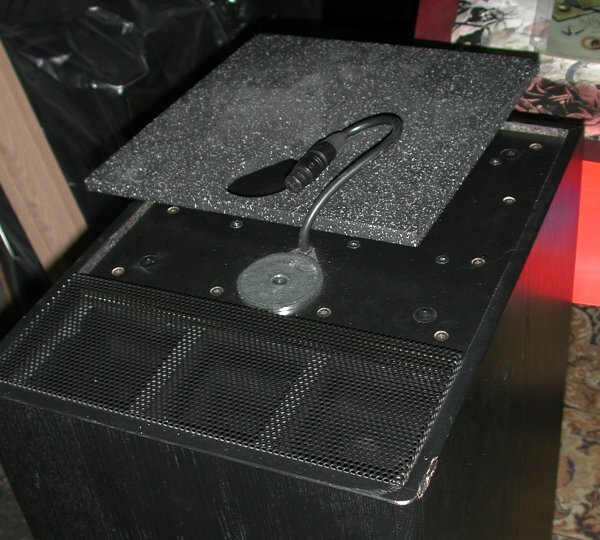 Remove the bottom woofer along with the aluminum rod and piece of round foam. Tear off the foam and unbolt the rod and add them to your pile of parts. Refoam and redonut the woofers. While installation is largely the reverse of removal (with the reverse of tearing out glued-in foam being gluing it back in), there are two steps that are slightly tricky. 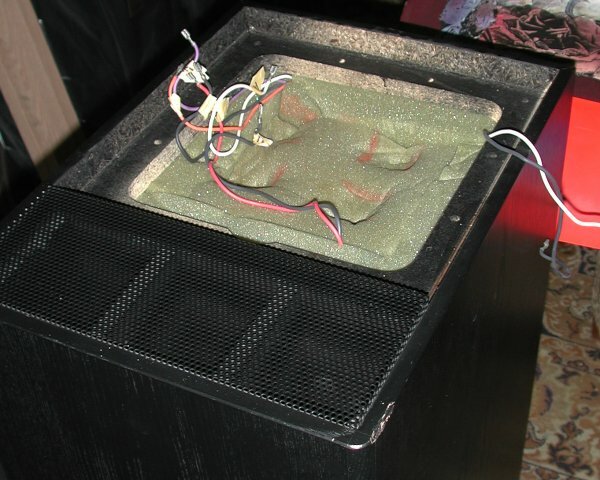 One is to make sure to position the bottom woofer terminals on a side adjacent to where its wires come from, or they won't reach. 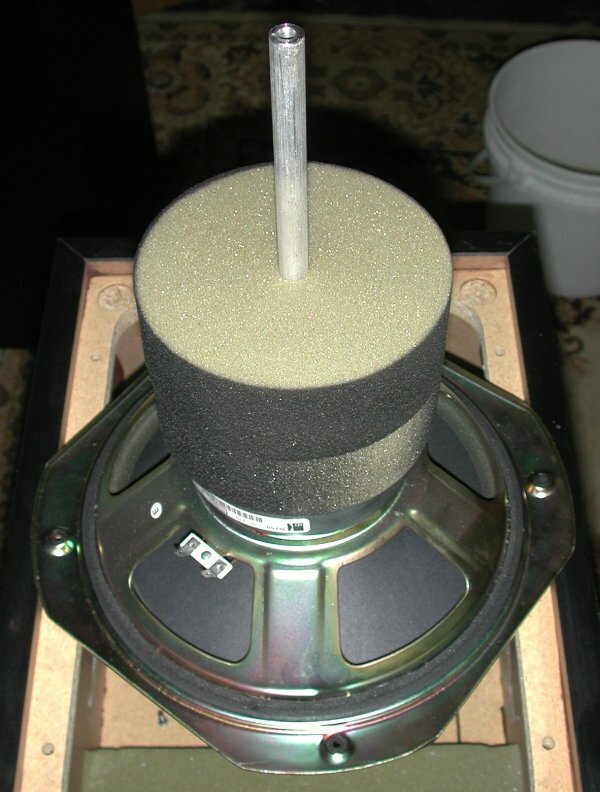 The other is that the aluminum rod will not necessarily be properly centered upon reassembly - it can be tightened at a non-right angle to the bottom woofer's magnet structure - the solution is to measure it relative to the studs before installing the top woofer to get it close, then use an awl or punch through the hole in the top woofer magnet structure to finally center it so the top bolt will thread in.